Further product development alongside Bosch will ensure that our newest product, NATEDE, which has already raised over €600,000 in pre-orders on Kickstarter, will be developed with the guidance of such a leading company that offers premier solutions to many sectors. Clairy, the Italian startup that focuses on improving home air quality using plants together with their proprietary technology, has won the top spot in the Bosch Pitching Challenge at the Pioneers’18 Conference in Vienna today. Clairy’s win grants the company an opportunity to further develop their products alongside Bosch, a leading global supplier of technology and services. Clairy’s newest product, NATEDE, is an upgraded, smart, natural air purifier of design that promises to improve indoor air quality with the lowest possible environmental impact. It is a dual-part flower pot; inside of the larger flower pot, a technology unit connected to a fan directs the air from inside a home or office to the roots of the plant in order to remove toxins. NATEDE is currently available for pre-order on Kickstarter, the famous crowdfunding platform. Clairy has raised more than $720k and has six days remaining in the campaign. The Bosch Group issued their pitching challenge at the Pioneers’18 conference to find possibilities to improve increasingly poor air quality found throughout Europe. Road transport, agriculture, power plants, industry and households are the biggest emitters of air pollutants in Europe. Bosch improves quality of life worldwide with products and services that are innovative and spark enthusiasm, creating technology that is "Invented for life," and they agreed that Clairy’s work aligns perfectly with their mission. NATEDE is currently available on Kickstarter for $170. For more information about the campaign, visit pr.go2.fund/natede. For more information on Bosch’s pitching challenge or the Pioneers’18 conference for pioneering entrepreneurs, visit https://pioneers.io/events/pioneers18#/. Following a successful Kickstarter campaign in 2016, the Clairy team took the feedback of their backers and created an updated version of their original natural air purifier with improvements that everyone will love. 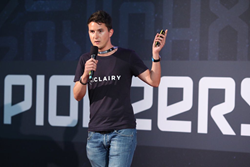 The Clairy team set out to increase quality of life by developing simple products that combine innovative technologies along with incredible designs. To learn more about Clairy, visit http://www.clairy.com.